Update: this screen could be from the Nikon E3 DSLR model back from 1998 (thanks Kyrken). 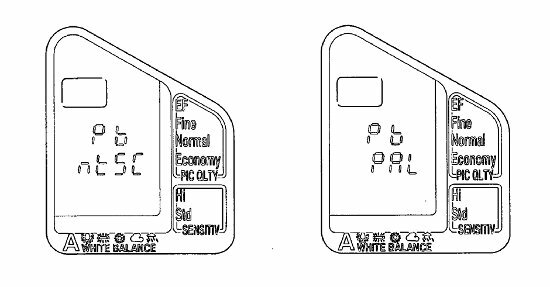 Patent application 20100103283 is for reducing the power consumption in a camera and has a drawing of an oddly shaped LCD screen. I wonder what shape must the camera have in order to accommodate an LCD screen like that. "In a digital still camera, when the reproducing mode is selected, an indication to the effect that the operation is in standby for reproduction is displayed on an indicating device, and if the command dial is not operated until 16 seconds elapses after the indication has been started, the supply of source voltage to the various parts of the camera is stopped, to achieve a reduction in power consumption. If the command dial is operated within 16 seconds, image signals are output to an external monitor and also an indication to the effect that reproduction is in progress is displayed on the indicating device. If the command dial has been operated within three minutes after reproduction of a given photographic frame has been started, reproduction of the following frame is performed, but if the command dial has not been operated until the three minutes have elapsed, the indication to the effect that the operation is in standby for reproduction is displayed again. 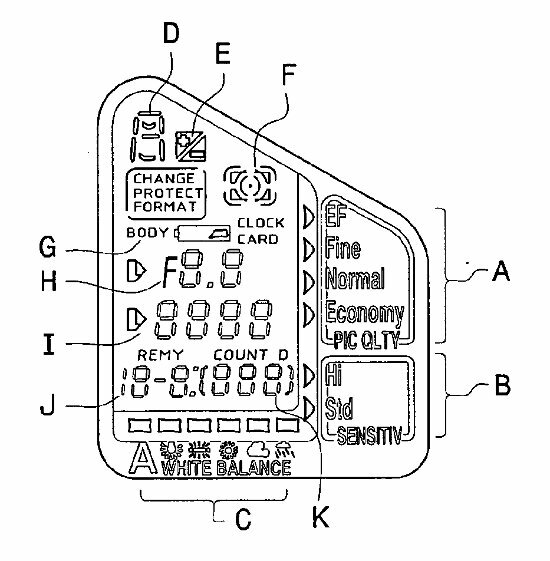 If the sensitivity changeover switch and the command dial are operated together during reproduction or standby for reproduction, the photographic frame to be reproduced is determined in correspondence to the quantity and direction of the rotation of the command dial and the frame number of the frame thus determined is displayed on the indicating device." "Figs. 14A and 14B show an example indication on the indicating device when the photometry mode switch and the exposure correction changeover switch are operated at the same time in the reproducing mode"
Is this the top LCD screen of the Nikon D600?